I really wanted to post my Diwali pictures. True to what I believe in, I decided to have a completely handcrafted Diwali. I toiled over Kesar Phirni (thanks to Sanjeev Kapoor), poured them into terracotta bowls and decorated them. Then I baked some Mattris (yes, I didn’t fry them!) in different shapes. Dressed in a traditional ‘Kandhangi‘ handloom saree, I decorated the whole balcony with diyas (terracotta lamps with oil), lit up the Vilakku ( brass lamp) and was all set to take pictures for the blog. That was when the catastrophe struck! 😦 My camera refused to detect the memory card and I didn’t have a spare! 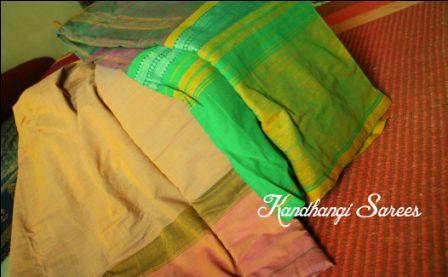 Since I won’t be able to give you a glimpse of my balcony (btw, my little lily pond is finally showing signs of revival), the least I can do is write about ‘Kandhangi’ sarees. I harbour a secret love for sarees. Though you may hardly ever find me in a saree, I am definitely a pro at wearing them and hope to have a collection someday. Characterised by huge borders (sometimes two-thirds of the saree is covered with the border), these sarees are woven using high quality cotton from Tirupur. 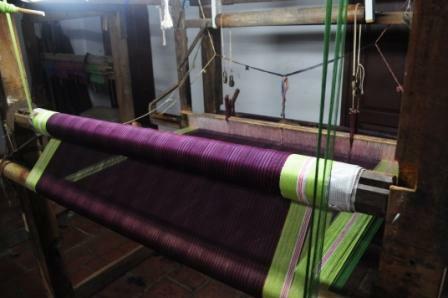 These sarees take about a week to be hand woven on the loom. Over time, the enterprising community anticipated the decline in demand for hand woven cotton sarees. 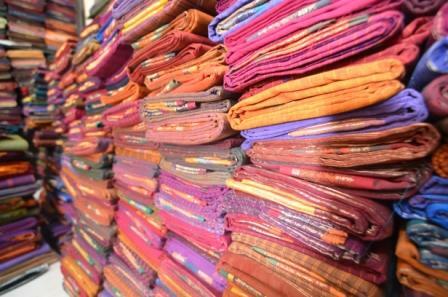 They have slowly diversified into making silk blended cottons sarees and stoles. Nowadays low quality yarn is also used to reduce the cost of raw material used. 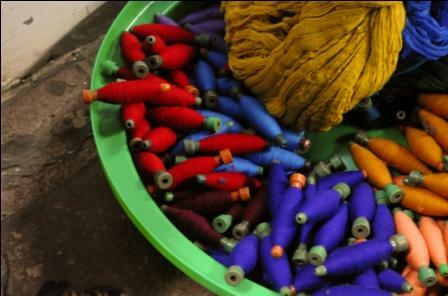 This cotton yarn is used to make those simple, yet stunning sarees. The hot weather throughout the year call for the use of light fabric, one that breathes. 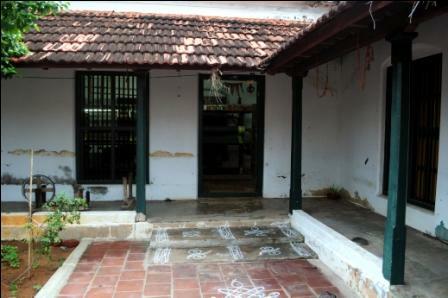 The looms were in an old house, whose courtyard and verandahs were used to showcase the products for sale. We sat down on the verandahs, enjoying the cool evening breeze and discussed the declining demand for such hand spun beauty. The lady of the house, dressed perfectly in true Chettinadu style was happy to share her knowledge and love for these sarees. This entry was posted in Craft and tagged Athangudi, Chettinadu, Kandhangi, Karaikudi, Sarees, Tamil Nadu tourism, travel by craftcanvas. Bookmark the permalink. Hey Richa, i am planning to set up a small sale online for these sarees, coupling them with interesting blouses from another state. Will pass on info when I do! hey nisha i want one of these beautiful sarees.